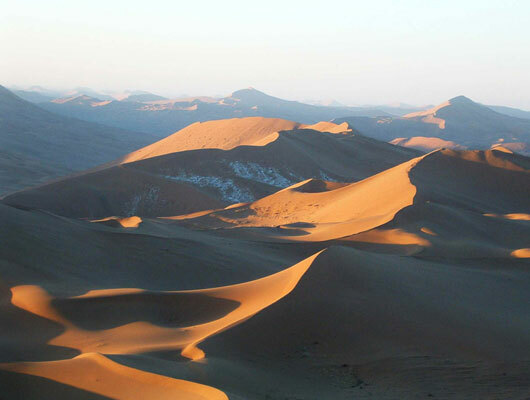 The Badain Jaran desert is the fourth largest desert in the world roughly 150 kilometers north of the Hexi corridor and covering an area of over 49,000 square kilometers. It is home to the largest dunes on earth, the highest of which tower over 450 meters tall and stretch over 5 km in length. In addition to its megadunes, the Badain Jaran also boasts roughly 140 spring fed-lakes that reside in the interspaces of its giant megadunes, creating one of the most captivating desert landscapes in the world. It is not a Ã¯Â¿Â½Ã¯Â¿Â½Waterless placeÃ¯Â¿Â½Ã¯Â¿Â½, from these lakes that the Badain Jaran has derived its name, which means "mysterious lake" in the local Mongolian dialect. It is the largest Ã¯Â¿Â½Ã¯Â¿Â½boomingÃ¯Â¿Â½Ã¯Â¿Â½ sand area in the world. By sliding down the sand dune, one can hear the sand booming like the tolling of a huge bell or the beating of a big drum. In the evening, the strong winds make the sand slide down the dune slope, producing booming by itself. The Badain Jaran is not a Ã¯Â¿Â½Ã¯Â¿Â½sea of deathÃ¯Â¿Â½Ã¯Â¿Â½. It is a live desert. 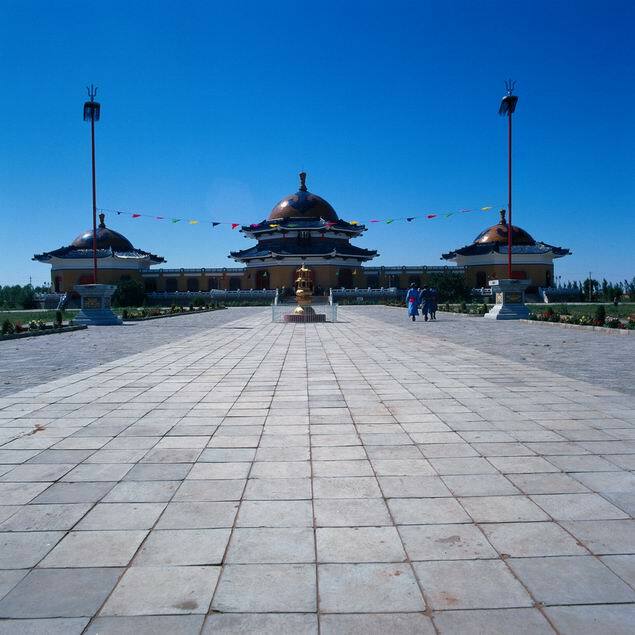 In the heart of the desert, Buddhist monastery, which once housed 80 monks, is built along the lake in 1755. Mongolian herdsmen with camels are living amid the big dunes that intersperse with spring-fed lakes. All are rare examples of a complete self-purification and harmony between lakes and sand dunes, the life of Mongolian herdsmen and their camels. Construction of China's first railway across the Ulan Buh Desert and Badain Jaran Desert in north China' s Inner Mongolia Autonomous Region will begin this year, local railway sources said. The 1,390-kilometer railway starts at Linhe in Inner Mongolia, runs westward through the Ulan Buh Desert and the along the northern rim of the Badain Jaran Desert on the Sino-Mogolian border, then enters Xinjiang Uygur Autonomous Region from northern Gansu Province and ends at Hami in Xinjiang, according to the railway administration of Hohhot, capital of Inner Mongolia. The estimated cost and scheduled completion date were not disclosed. The section of the railway in Inner Mongolia is 1,070 kilometers and the sections in Gansu and Xinjiang are 320 kilometers. Upon completion, the railway will serve as a direct link between north and northwest China and will be a convenient passage linking Xinjiang with north and northeast China and the national capital, Beijing. The Linhe-Hami railway runs along the north route of the ancient Silk Road, which was the land thoroughfare linking China with Central and Western Asia to the eastern shore of the Mediterranean between the second century B.C. and the eight and ninth centuries A.D. The Ulan Buh Desert and the Badain Jaran Desert are the third and fourth largest deserts in China. The worldÃ¯Â¿Â½Ã¯Â¿Â½s tallest sand dunes, some half a kilometre high, survive in a windy desert in northern China because water cements them together, a new study suggests. Ã¯Â¿Â½Ã¯Â¿Â½Our finding could transform plans for the regionÃ¯Â¿Â½Ã¯Â¿Â½s water resources,Ã¯Â¿Â½Ã¯Â¿Â½ says the team, led by Jian Sheng Chen of Hohai University in Nanjing, China. Up to 500 billion litres of water could be extracted from the desert every year, the scientists suggest. Ã¯Â¿Â½Ã¯Â¿Â½The idea that water stabilises the sand dunes is interesting,Ã¯Â¿Â½Ã¯Â¿Â½ says Mike Edmunds, research director of the Oxford Centre for Water Research in Oxford, UK, but he takes issue with the suggestion that the underground water could be extracted to meet local demand. Ã¯Â¿Â½Ã¯Â¿Â½They are trying to recommend this as a new water resource when in fact itÃ¯Â¿Â½Ã¯Â¿Â½s fossil water. It is from a past climate,Ã¯Â¿Â½Ã¯Â¿Â½ Edmunds told New Scientist. He has collected data in the same desert and says there is no evidence that the water levels are being topped up by melting snow. Ã¯Â¿Â½Ã¯Â¿Â½The water found is clearly essential for maintaining the stationary dunes,Ã¯Â¿Â½Ã¯Â¿Â½ says Ling Li, a member of the team. In other windy deserts, dunes tend to migrate in the direction the wind blows. But Edmunds considers this conclusion to be flawed. Ã¯Â¿Â½Ã¯Â¿Â½TheyÃ¯Â¿Â½Ã¯Â¿Â½ve taken two and two and made 73,Ã¯Â¿Â½Ã¯Â¿Â½ he says. With regard to water supply in the desert, there are already plans for a massive and expensive water diversion project in the region which would send water from one river to another to meet the needs of local farmers. Extracting water from deep wells in the desert could be a practical alternative, according to ChenÃ¯Â¿Â½Ã¯Â¿Â½s team. But Edmunds counters that the difference arises only because the ancient reservoirs are drying out. If the fossil water is extracted, this will only happen faster. He says locals would be relying on a water resource that would ultimately run out and that the ecology of the area could be damaged irrevocably. Ã¯Â¿Â½Ã¯Â¿Â½It could be a disaster,Ã¯Â¿Â½Ã¯Â¿Â½ he warns.